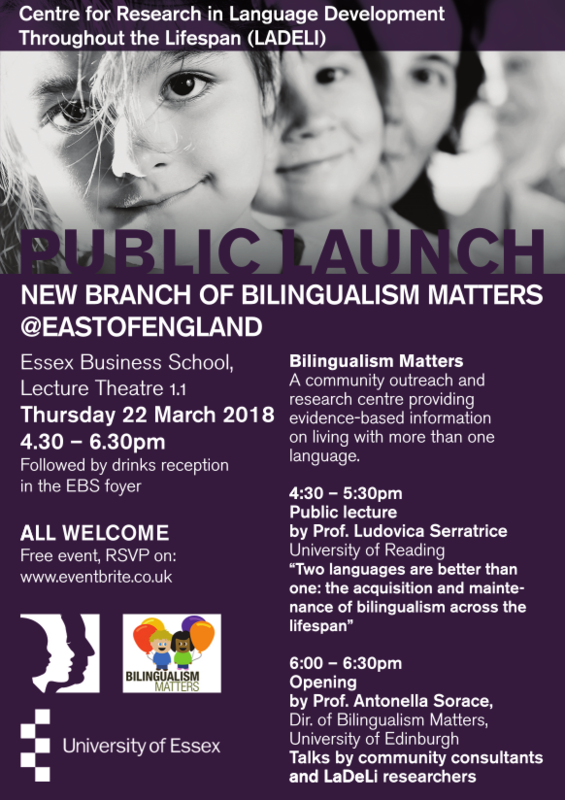 "Evidence informed practice for EAL"
9th Essex Language Conference for Teachers (ELCT) - 10 July 2018 9am - 4pm. BAAL Language Learning and Teaching Special Interest Group. Annual conference. Language teaching and learning in unstable times, and in changing political landscapes 12–13 July 2018, University of Southampton. Early language learning conference; second and foreign language learning in preschool and primary education contexts across the globe: Early Language Learning: Multiple perspectives – Diverse voices. June 13th-15th, 2018. Reykjavik, Iceland. The Vigdís Finnbogadóttir Institute of Foreign Languages and the School of Education, University of Iceland in association with the AILA Research Network on Early Language Learning. Multilingualism in International Organizations and in International Co-operation. Symposium of the Study Group on Language and the United Nations, New York on Thursday and Friday, May 10 and 11, 2018. Keynote address by Michele Gazzola. The Launching Conference of the CEFR Companion Volume with new descriptors (16-17 May), Strasbourg. 52nd Annual International IATEFL Conference and Exhibition, 10th - 13th April 2018. A 4-day programme of around 500 talks, workshops and symposiums. Brighton. Linguistics and Knowledge about Language in Education (LKALE): BAAL Special Interest Group. A two-day conference bringing together researchers, teachers, examination boards and other interested parties: Teaching grammar: from theory to policy and practice. April 27th and 28th, Aston University, Birmingham. Bilingualism Matters is a community outreach and research centre providing evidence-based information on living with more than one language. 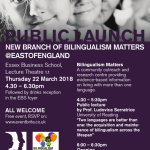 Language, literacy and learning in children who speak English as an additional language (EAL) A free research-into-practice event for teachers and education practitioners working with children who speak English as an additional language. 21st March 2018, 2pm – 6.30pm. University of Reading. NALDIC 25:- 25th Annual Conference: Educating Multilingual Learners In The 21st Century: The Next 25 Years. November 18th 2017, King’s College London; Franklin-Wilkins Building Stamford Street, London, SE1 9NH. British Academy workshop: Language, literacy and learning in children who speak English as an additional language (EAL). 26th and 27th September, 2017. St John's College, Oxford. A two-day workshop for researchers, practising teachers, and policy-makers: Languages in the primary classroom. 22-23rd June 2017, University of Essex. Plenary / Keynote speakers: Prof. Victoria Murphy (University of Oxford) and Prof. Constant Leung (King’s College London). Multilingual Learners in Context: EAL, complementary schools and international schools. 17th June 2017, Oxford Brookes University. Sheffield EAL Conference: Accelerating Progress and English Proficiency for EAL Learners. Thursday 15 June 2017, Sheffield Hallam University.